I decided to see this movie while it was still in the theater here. 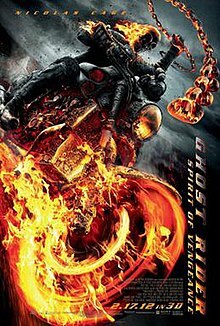 I tend to like movies based on comic book characters, sometimes even ones that other people don't like, including Ghost Rider. I could tell by the trailers that this one was going to be different, but I didn't realize how different. I ended up seeing this in 3D because of the start times. The non 3D was only playing once a day, at about 10:00 pm, and that just wasn't possible when I was working. The 3D is completely pointless and it is a waste of time to watch that version. There are no shots that take advantage of the 3D. Johnny Blaze is hiding out in Eastern Europe, trying to avoid people and turning into the Rider. A monk who like to drink, Moreau, finds Johnny and talks him into trying to help protect a young boy named Danny by offering to get rid of the Rider. Johnny and Moreau then head off to protect Danny from the people after him who just happen to work for the Devil. The plot, such as it is, is a big stinking mess. I wasn't expecting a lot from the movie, but it was still disappointing. The movie really doesn't build on anything from the first movie, and is barely connected to it. By the end of the first movie, Johnny knew that the Rider was the Devil's bounty hunter and he had figured out how to control him. Johnny decided to keep the Rider and fight evil. In this movie, all that is out the window. Johnny seems to have no control where the Rider is concerned. He asks what the Rider is, and gets a different explanation. He also wants the Rider gone. Some semblance of continuity with the first movie would have been nice, but there is none. The plot isn't that interesting and everything tied to Danny just doesn't work that well for me. The effects are a mess. Ghost Rider is a flaming skeleton and his motorcycle is covered in flames as well. There are very few flames in the movie. Instead, the Rider is mostly spewing black smoke, sometimes so much, that it blocks other things. That looks horrible. The Rider doesn't use his chain that much. He moves so fast at times, it is almost like he can teleport. During one scene, when the Rider is there to confront the bad guys, he just stands there, sort of swaying and it looks absolutely ridiculous. I just realized that it looks like how some of the characters in World of Warcraft or Diablo III sort of sway when standing. The action scenes don't work that well. The camera work is very jerky and shaky, which is highly annoying. Some of the scenes look like they are playing too fast and others use the stupid slow motion. The characters are a mess. Johnny really doesn't seem to be the same character from the first movie and Nicolas Cage reaches new levels of haminess that I didn't think were humanly possible. His hair was weird too, which was distracting. There is no explanation for how Moreau knew anything about the Rider, including Johnny being the Rider..or being possessed by him..whatever. Roarke is the devil, and he is supposed to be the one that Johnny sold his soul to originally. Anthony Head is in the movie very briefly. I think there was potential for a somewhat decent movie, but this one isn't that great, though I have seen worse movies. This movie is a giant mess and really not worth seeing...unless you are like me and feel compelled to see all the movies based on comic books you come across. I just can't help myself, but there is no way I'm buying this one. I do draw the line somewhere.